Allen Jones was born in North Carolina in 1799, the son of Joseph Jones. His mother’s name is not known. However, in the 1850 census of Hickman County, Tennessee, Joseph’s wife was listed as “Ruth”; but we are not sure if she was the mother of his children. Allen was the third of Joseph’s fourteen children. The family moved to Hickman County, Tennessee in 1809, and settled near what is now Columbia, where they were farmers. In 1822 Allen was married to Elizabeth Hicks, a daughter of Berry Hicks. To this union were born eleven children, one of whom died young. Three of Allen’s sons became doctors: John Joseph, George W., and Thomas Hicks. No documentary evidence has been turned up to support the claim that Allen was a doctor. However, family tradition has always held that he was. This was passed down to me and my cousins from our fathers who, in turn, heard it from their father, William Allen, who was a grandson of Allen. Our grandfather, William Allen, no doubt heard it from his mother, as his father George W., died when he was two and one-half months old. He grew up knowing his uncles, aunts, and cousins, and, no doubt, also his grandfather, as he would have been fourteen when Allen died, and they lived in the same general area. No census lists Allen as a doctor–he always gave his occupation as “Farmer”. No histories we have read of the era make any mention of him, except that he was the father of one of his sons who was a doctor. Research has not turned up his burial place with a tombstone that might mention him as a doctor. Yet, it would seem strange that the tradition would be handed down so directly if it were not true. In those days doctors were not required to go to medical school, but could study under a reputable doctor, work with him a while, then hang out their own shingle. After Allen’s sons became doctors, he probably retired from his practice and left it to them. After a generation or two, the general public would have forgotten him, thus, no “stories” in the history books. In 1851, Allen and Elizabeth moved, with their entire family, from Tennessee to north-central Arkansas. They settled in the area of Springfield, then the county seat of Conway County, and in that general area, where “he put his several sons to farming while he went about establishing his medical practice”. His son, John Joseph, who had received his medical training in Tennessee and had practiced four years in Alabama, chose an area of the county on the opposite side of Springfield from his father. We are not told any more of Allen, nor of how long he practiced after he came to Arkansas. Allen Jones died in 1872; his burial place is not known–it was very likely a private family cemetery. From Allen have descended ten doctors who have practiced, at least for a while, in Arkansas, and three others who have never practiced in this state. Besides doctors, there are, all living today, eight or nine nurses or those in related medical fields. 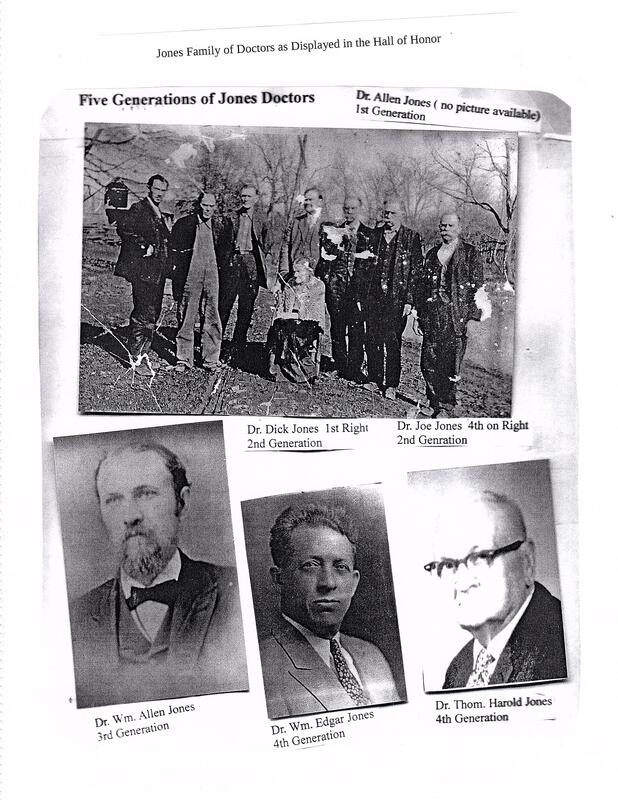 Contributed by Loleta (Jones) Farish, great-great-granddaughter of Dr. Allen Jones.